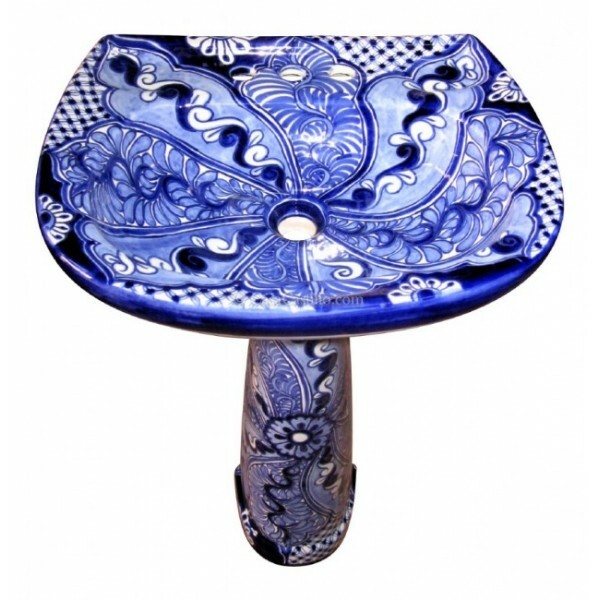 Own a unique Hand Painted Mexican Talavera Toilet made by the Artisan's dedicated work and passion. Forget about the boring plain colored toilets and bring a lively piece of Art to your bathroom that will amaze your guest. 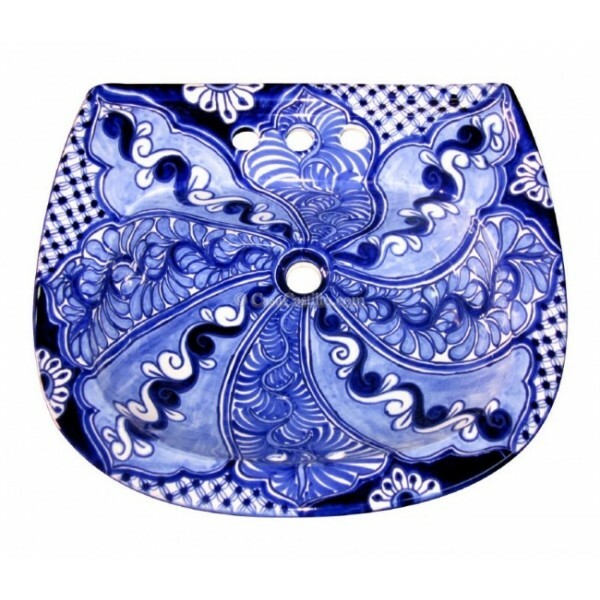 Wonderful hand painted talavera toilet set in a typical white forms and shapes over blue background. The artisan's work is truly a master piece with long, patient hours of detailed painting, inspiration and passion the end result will surely amaze you and beautify your bathroom in a very unique way, not to forget the impression your guests will have: a big whaoooo... where did you get that?.. Made to comply with the American plumbing standards you will not have a problem with installation, parts or maintenance. This set will make your bathroom decoration perfectly match: Sink, accessories and toilet. See our specifications tab for more detailed information. 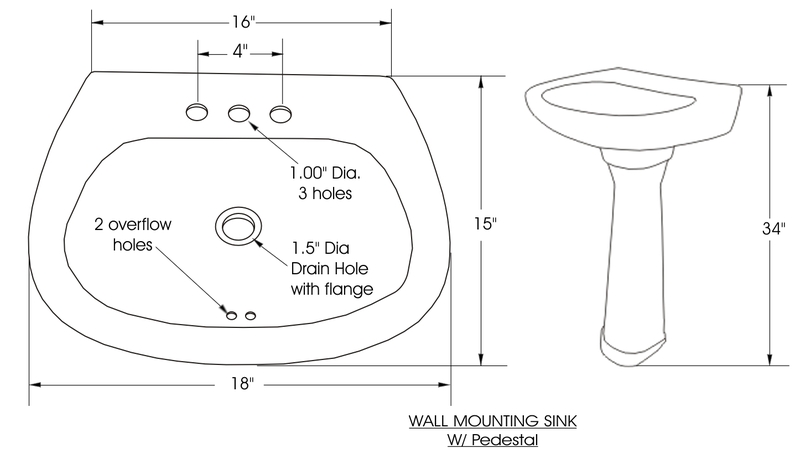 1 Sink (Oval drop-in, Vessel, or Pedestal. Please specify your selection above). Material: Toilet bowls and tanks are made from a special clay called vitreous china. Vitreous china is a mix of several kinds of clay, called ball clay and china clay, silica, and a fluxing agent so the toilet is actually waterproof and stainproof through its entire thickness. The paint will NOT fade over time even with the hard water use. Our paint is lead free and 100% safe for home use. 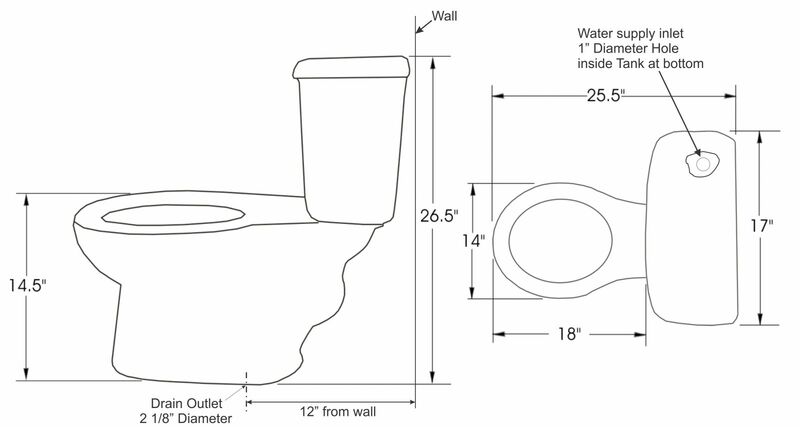 Toilet Size: Tank capacity is 1.5 Gallons, flush can be regulated to comply with your specific state requirements by installing the correct flushing mechanism. Oval drop in 17" x 14"
Oval drop in 21" x 14"
If your don't see the pattern you are looking for we are happy to help you. We can make very much any design you have in mind at no extra cost. Just contact us and let's talk about it. Use a sponge or damp mop with an ordinary non-abrasive household cleaner. Rinse and dry with cloth. If white grout is used, you can occasionally whiten the grout with liquid bleach. Be careful to rinse afterwards. Note: Please remember that handmade crafts are not consistent in their dimensions due to the nature of being crafted by hand and a half an inch variance should be allowed for all planning and designing. Also, due to variations in products and monitor settings, images may differ from the actual product. 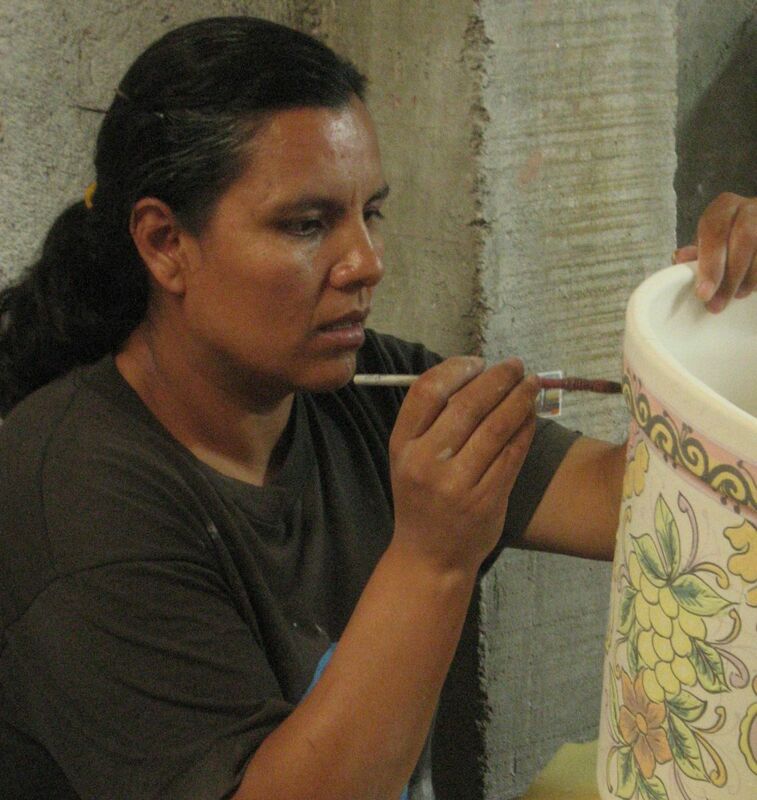 “I learned the Talavera technique from my father and I had the initiative to start painting toilets, about 15 years ago, at that time I would have to get the toilet in a raw state, painted and then send it back to the factory to have it burn. People from all over started to come and ask me to paint their specific designs, slowly the clientele grow and I was able to expand and started making the toilets myself, hiring other friends and family to help me". Today Mario's small shop has grown to a full toilet factory where he can manufacture them from scratch. 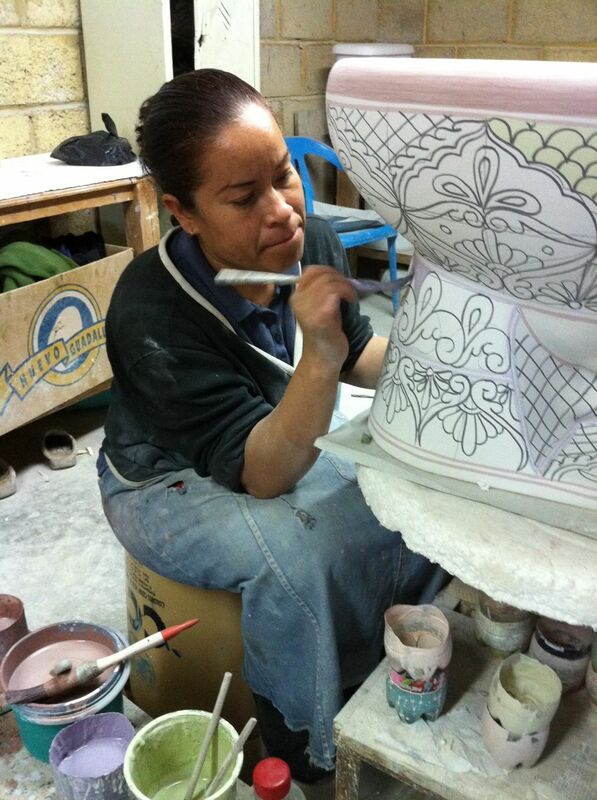 This is a big must when producing talavera hand painted toilets, the artwork must be done at a the "raw" state of the toilet, previous to be glazed and burned at the high temp ovens. Some lower quality hand painted toilets are done after glazed, in this case the paint will fade in not time. But with Mario's full manufacture process your talavera toilet will keep its paint with not signs of fading for the life time of your toilet. "My main Motivation has always been to give the best I have to please the client so I am constantly searching for ways to improve techniques and qualities, as well as creating new designs. Our ever increasing creative design’s motifs range from a wide variety of plain colors to the pre-Hispanic, colonial, and ethnic motifs. In the process to create a Talavera Toilet, we basically use ceramic pastes and clay and we recycle all the wasting materials. "Each toilet is made from an special clay (arcilla), then shaped in molds and allowed to dry naturally, the process takes around 10 days. When dry, the pieces are delicate and need sanding and firing to prepare them for the decorative process. Pieces are first coated with white enamel and then painted individually, always by hand, sometimes aided by plastic stencils. The pieces come to life with strikingly rich colors when they are fired for 5 hours at a temperature of 1100° Celsius (2012° Fahrenheit) in the kiln. I'm sure you will be surprise of the beauty of these toilets; once you receive your package and unwrap it a big surprise awaits you. I have try to make honor to his work by taking the best pictures possible, but even that will not give true honor to these amazing creations. Enjoy your unique piece of art and be ready to surprise your guests. Thank you in the name of Mario Fabricio, his family and artisans that work with him. - All our shipments are covered with insurance for any loss or breakage during transit. - We use DHL or Fedex for better service and full tracking on line. - We use a professional packing company for all our shipments, your art will go very well protected with at least 2" of foam all around, bubble wrapped and when necessary double boxed. Rest assure it will reach you safe and sound. We have a record of minimum broken pieces if any. How long will it take to have my order delivered? Please check our shipping information tab for specific timing for your country. Are these toilets made to American Plumbing Standards? Yes, Mario's factory is in compliance with the NOM regulations (Mexican Norms), the NOM are in compliance with the ASME A112.19.2 ( American Standards Regulations for Ceramic plumbing fixtures). You should have not problems installing your toilet, all the plumbing holes and attachments are American Standard size. 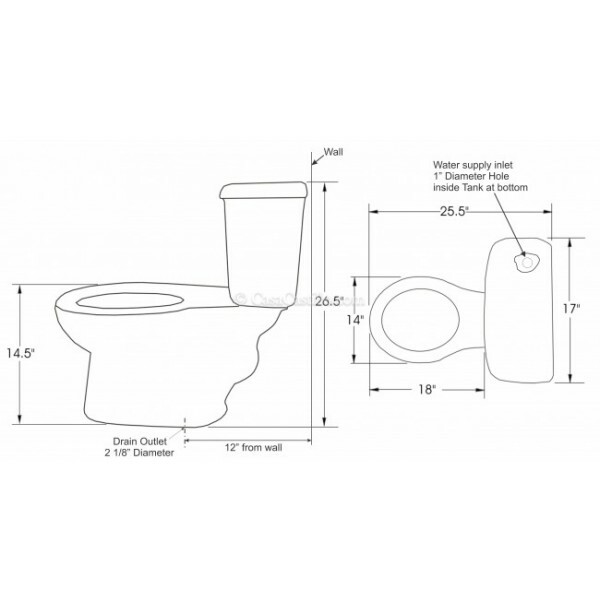 Also if you need to regulate your flushing amount you can do so by selecting the proper flushing mechanism (you can buy at any home depot several options), our toilets will take most of the American flushing sets. Why can it take long time to deliver my handicraft? A true handcrafted art is made per order, this allows the Artisan to use fresh materials and take the time to make a wonderful piece, at the same time giving our customers a unique opportunity to specify any requirement they may need or want, so you get a chance to request your unique ideas/designs. We believe in keeping low to zero inventory helps many ways: Environment, low costs, space, energy, etc, and we are happy to pass those savings to you and give more to the Artisan, that is the beauty of working directly with the handcrafters: You get what you really want. We appreciate your patience, however if you are in a rush we also can help you by hiring more Artisans or having the family's Artisan work together, so please feel free to contact us if you need your Mexican Art by an specific date. We most surely can supply your needs.